Sign in to generate a username & password. Send it along with the Demand Draft in favour of HCG Charitable Trust, payable at Kolkata. Fill up the document with the necessary details. The applicants will be shortlisted on the basis of NSHM Personality & Aptitude Test (NPAT). Candidate should have passed 10+2 from any board from any stream with English as a subject from a recognized board to apply for NSHM Knowledge Campus admission. The candidate should have passed 10+2 from any board with English and Mathematics/ Statistics/ Business Mathematics/ Computer Science as subjects to apply for NSHM Knowledge Campus admission. Candidate should have passed 10+2 from any board with English as a subject, in any stream from a recognized board to apply for NSHM Knowledge Campus admissions 2019. For admission to NSHM Knowledge Campus, Kolkata, candidates should have passed 10+2 with Science (Physics, Chemistry, Biology/Maths) from a recognised board. Candidate with diploma holders in Pharmacy have to be qualified in West Bengal Joint Entrance Examination for Lateral Entry (WBJELET) are eligible for entry to the 3rd semester (2nd year) of the B. Pharm Course. The candidate should have passed 10+2 from any board having any stream background with English as subjects. Candidate should have a graduation degree from any stream from a recognised University with a valid score of any all India level Management Aptitude Test. The candidate has to be a graduate in any stream from a recognized University to apply for NSHM admissions. The candidate has to be a graduate with Mathematics / Computer science as subjects to be eligible for admission. 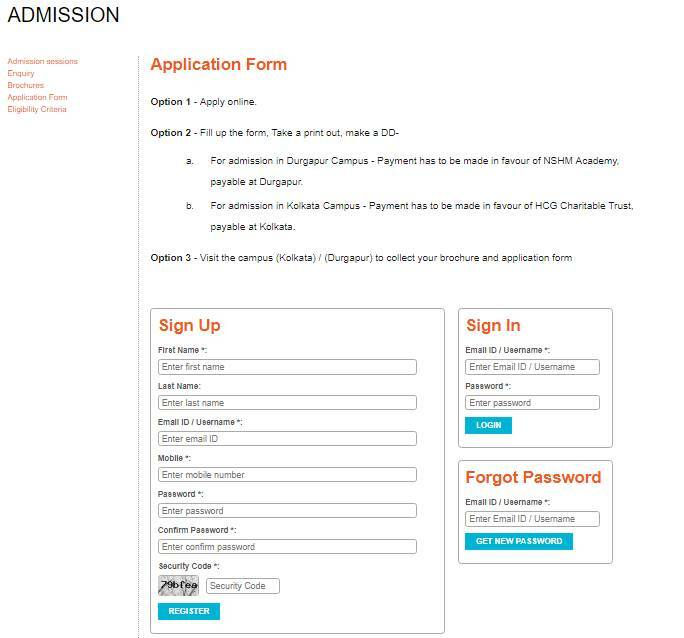 The admission procedure is pretty simple: Applying students need to go through a screening procedure after applying for the course. There is an admission test for students seeking scholarships. Cut off varies from year to year, but usually having a 60℅ in +2s work. The student must pass 12th grade with a good percentage. The cutoff is 60% to get the admission in this college. The cutoff for admission is 60% in 12th grade.